I downloaded this onto my Kindle some weeks ago along with 3 other books, 1 of them a novel. I had a weeks holiday coming up and I wanted to get some serious reading done, the fact that the week in question turned out to be something of a heatwave meant that whilst we did walk a lot, we sat soaking in the sun and reading a lot too, continuing into the cooler evenings after great food and whilst drinking good beer. Herefordshire is a beautiful place with beautiful scenery and wildlife, the combination of good things was spot on. So VoM, well Varg is a friend and I really like his stuff anyway so I was really looking forward to reading it. I was not disappointed. He does not pull his punches, he holds no sacred cows and his experience flows throughout the book. I have long held the view and stated often in my training that I can teach the physical stuff pretty quickly, once the fundamentals are explained and inculcated in the student, teaching technique is not that difficult, learning it is. Its why we constantly revisit the fundamentals, however many times that takes, we do that. The difficult part, I tell all and sundry, is developing the mindset to put what is learned into practice, first in a safe environment, then increasing the resistance until the student gets a chance to validate if they can make it work. Reading VoM affirmed much of what I know and do, that is always a pleasure, but, it also made me question a few things and reframe others. As I read VoM I had images in my mind of how we train and teach, reading VoM helped me imagine tweeks and changes we could make to get better so that our curriculum offer can evolve further. VoM is unique due to Varg being unique. Very few in our business, whatever that is, have anything like his experiences or his extraordinary ability to articulate complex ideas and concepts without using technical jargon. In fact he shoots down, pardon the pun, those who hide behind jargon and pseudo sceince. The criminal mind is not our mind, we cannot truly think like fully socialised hardened criminals, but as instructors we have a duty of care at least to learn how they think and the harshness of the world their mindset is forged in. VoM exposes how those who teach art, who teach students that nice moves learned in a nice dojo with nice partners are about as much use in a fight against a violent criminal as a chocolate fireguard. I know a little of this as I have hunted men, ambushed, hurt them, for fun. Lets stay with the book though. Read this book and then reflect on how you train and if an instructor how you teach. Reflect very hard on what you teach. Do you, can you, explain to your students what they may come up against, what they will be dealing with, do you know yourself? If the answer is no or not sure, and the best tactic is err on the negative, get this book, read it once, leave it a while then read it again. The lessons are there if you want them. For me my holiday is walking in the countryside with my wife and our little dog. Its about time together, good food and a few beers. It is also time to learn free from classes (thank you to my excellent cadre of instructors), time to read, reflect, learn and move forward. I was really looking forward to reading VoM, to say I was not disappointed is an understatement. Footnote; The morning after I read VoM I read an back article from The New Scientist callec Circuit Training for the Brain by Teal Burrell. 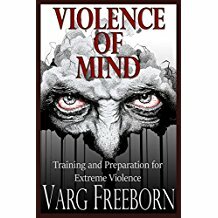 In a fantastic article she uses a concept, proprioception (look it up you muscle memory cavefolk lol), that I had first read in VoM the day before, needless to say, Varg had it bang right.